How often should I get my oil changed? A general rule would be 3000 miles or 6000 for synthetic. Some manufacturers suggest much longer intervals under ideal conditions. Driving conditions are seldom ideal. Lots of idling, stop-and-go traffic, short trips, extremely hot or cold weather, humidity and towing can all decrease the lifespan of engine oil. Plus, every car is a little different. The interval that is perfectly fine for one could be way too long for another. Synthetic motor oils can be a good choice for high output, turbocharged or supercharged engines. Or for vehicles that are used for towing (especially during hot weather), and vehicles that operate in extremely cold or hot climates. Although more expensive than mineral-based oils, synthetic motor oils can improve fuel economy and provide longer intervals between changes. For warranty concerns you should never exceed the manufactures intervals. Many auto manufacturers now specify synthetic oils. What brand of oil do you use? We carry Pennzoil for conventional oils, Mobil1 for synthetics & Shell Rotella T for diesels. We also have Mobil1 extended life oil filters. Your tires should be rotated every other oil change, or every 6000 miles. This is especially recommended with 4×4 & all wheel drive vehicles. Neglecting to rotate tires is a major cause of premature tire wear & may void your tire warranty. We will note your brakes condition when we rotate your tires. How long will my brakes last? This depends on the type of driving you do whether city or highway. Also the type of driver you are, and your type of car. How often should my brakes be inspected? We will do a visual brake inspection when we rotate your tires. As recommended by your vehicle’s manufacture. Generally from 30,000 or up to 100,000 miles if your vehicle is equipped with platinum or iridium tipped spark plugs. As recommended by your vehicle’s manufacture. Generally every 50,000 miles. As recommended by your vehicle’s manufacture. Generally that is from 60,000 to 110,000 miles. YES. The failure of a timing belt in many cars can result in major engine damage. The cost of repairing an engine with a broken timing belt can be much greater than the cost of a timing belt replacement. There are many sensors and computerized components that manage your vehicle’s engine performance and emissions. When one of these fails, the “check engine” light is illuminated. 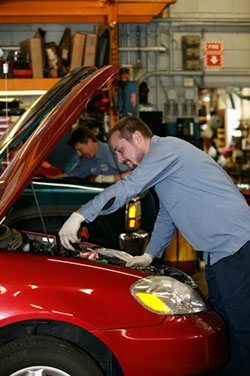 Although your car may seem to run fine, it is important to have the issue addressed to prevent long-term problems. Do you charge to diagnose things like a check engine light, emissions or running condition? Yes, often a diagnosis is complex and time consuming. Sometimes it can be more consuming than the actual repair itself. Please give us a call to discuss your situation. I have towing insurance or have a motor club membership can you tow my car? YES, with insurance, most companies will reimburse you for towing or road service when you submit a receipt. NO with most of the motor clubs. 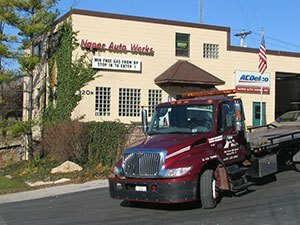 In those cases contact your motor club & request that you car be towed to Naper Auto Works. Please be aware that at times motor club towers may try to “steer” you to there own place or to one that they have special arrangement with. I have to have my car towed, its after hours & it can’t wait until you are open, do you have a 24 hour towing company you would recommend? Yes, Call Naperville Towing Service 630-961-9484. You can pay them directly or we can include it on your repair invoice. What should I do if my car starts to overheat or any other RED malfunction lights come on? This is a very serious problem – if your car overheats for too long, you can damage your engine. As soon as possible, find a safe place to pull off the road and shut the engine off! Do not attempt to check the fluid level in the radiator; the hot fluid can cause severe burns. 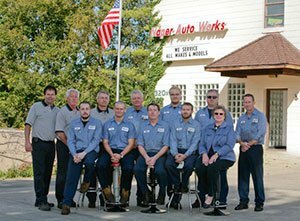 The best thing to do is to call & have your car towed to Naper Auto Works, your trusted auto repair facility! Do you work on hybrids? Yes, our technicians have had special training on hybrids. Always replace burned-out fuses with ones of the same amperage (printed on the fuse) and note that if a fuse continues to “blow,” you should have the circuit checked professionally by one of our technicians. How do I make sure my car battery is good and has a good electrical connection? Your battery and terminals should be cleaned and inspected periodically. A battery test is included with our oil change.